Habitat : Extensively cultivated in hotter and moist part of india. 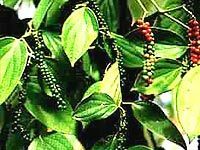 Uses : Piper Nigrum or Black pepper oil can be used to help in the treatment of pain relief, rheumatism, chills, flu, colds, increase circulation, exhaustion, muscular aches, physical and emotional coldness, nerve tonic and fevers. It furthermore increases the flow of saliva, stimulates appetite, encourages peristalsis, tones the colon muscles and is a general digestive tonic. Sometimes it is used in place of cubebs for gonorrhoea. As a gargle it is valued for relaxed uvula, paralysis of the tongue. On account of its stimulant action it aids digestion and is especially useful in atonic dyspepsia and turbid condition of the stomach. It will correct flatulence and nausea. It has also been used in vertigo, paralytic and arthritic disorders. It has also been advised in diarrhoea, cholera, scarlatina and in solution for a wash for tinea capititis. Externally it is used for its rubefacient properties and as a local application for relaxed sore throat and some skin diseases. Its oleoresin has bacteriostatic and fungistatic properties.